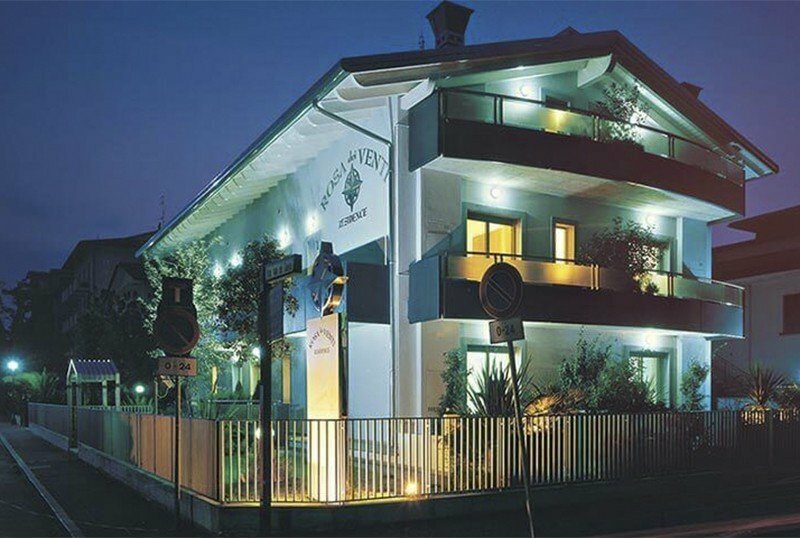 The Residence Hotel Rosa dei Venti is a 4-star hotel located in Pinarella di Cervia on the front line in front of the pine grove that precedes the beach. It has apartments suitable for up to 6 people, elegantly furnished and equipped with a balcony. Accepts pets of all sizes. The residence is located in Pinarella di Cervia in front of the characteristic pine grove that runs along the beach. To reach the sea it is sufficient to walk for a couple of minutes through the pine grove. There are studios suitable for up to 4 people and three-room apartments for 6 people. All apartments have a balcony and some also have a garden. They have a living room with kitchenette with oven and dishwasher, telephone, safe, washing machine, bathroom with shower, TV 40 "hospitality display-PC-access point (with web browsing and WI-FI), air conditioning and heating. daily cleaning service and meals, also take-away, at the restaurant of the nearby Hotel Garden. The hotel has a garden, a sun terrace, a reading room, a lift, a double beach towel per room available in hotel accommodation package. We organize theme nights, is equipped for cyclists and offers guests the opportunity to freely access the garden and pool of the nearby Garden Hotel, with beach towels available. PARKING: unguarded, covered and uncovered available to all guests (it is not possible to reserve seats). 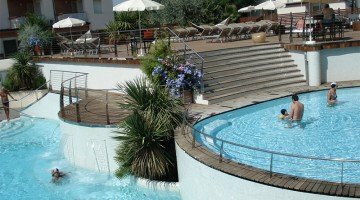 CONVENTIONS: beach, amusement parks, organized excursions (by canoe to the salt pans of Cervia with guide, by boat, to the natural park of Cervia, to the Butterfly House). LUNCH AND DINNER: guests can use the restaurant of the nearby Garden at special prices. In the hotel: indoor playground area, children's pool, strollers, entertainment, baby / mini / junior club. For a fee: pediatrician and baby sitter. At meals: baby menu, baby food, high chairs, bottle warmer, afternoon snack. Guests have free access to the swimming pool at the nearby Hotel Garden, with a cervical hydromassage and waterfall, an 80 cm deep children's pool and a separate hot tub. The beach of Le Lido offers guests a range of services including bar, restaurant, large playground with inflatables, rich daily live entertainment program for adults and children, TV room, WI-FI, library. Prices are per apartment for 7 days. - The reservation is confirmed if accompanied by a deposit of about 30% of the total amount. In the apartment formula included linen and sun beds at the private beach!